These are the words that launched our beloved series, prophetic words that foretold of the common bond between two extraordinarily unlikely companions. 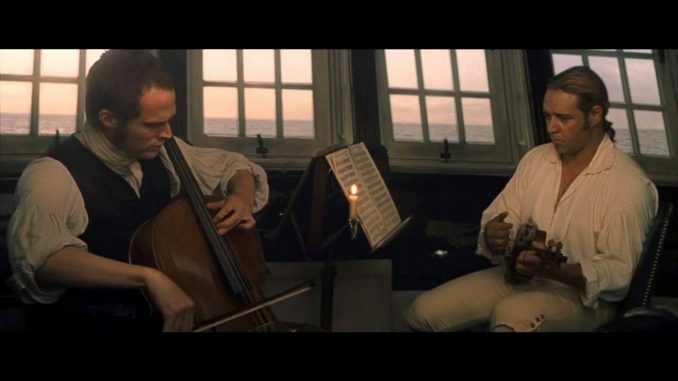 At sea or ashore, whenever respite from real life is required, Jack Aubrey and Stephen Maturin take up their respective instruments and ignore the world for awhile. Locatelli is one of their favorite composers to “practice upon”. A somewhat obscure composer in our current era, he was both well known and well respected in his own time. Locatelli was one of the leading Italian violinists and composers in the first half of the eighteenth century. At one time, he was known as the “Paganini of the eighteenth century” due to his 12 concertos and 24 caprices for violin. Although he was known primarily as a virtuoso violinist in the early part of his life, his abilities as a composer were far more important. Stylistically, Locatelli worked within the conservative forms of the composers of the Roman school (Corelli, for example), but incorporated many of the more progressive elements of the Venetian school (Vivaldi, above all). He wrote mostly sonatas and concertos for string instruments, although there is a set of flute sonatas, and a lost concerto for wind instruments with strings. With the exception of those flute sonatas, Opus 2, which occasionally have three movements, his other works were almost exclusively in the older four-movement format. Locatelli also made the written-out cadenza a standard part of his violin concertos, an innovation from the earlier practice of exclusively improvised cadenzas. In general, though, his style was a consolidation of existing trends, yet still original in the beauty and resourcefulness of its harmonies. Very little is known about Locatelli’s early life and training, other than that he held a post as violinist in Bergamo until 1711. By 1712, he was in Rome, probably studying with Giuseppe Valentini, Corelli’s rival. During the subsequent years, Locatelli worked exclusively as a violinist, particularly at the basilica of St. Lorenza in Damaso, Italy. In 1725, he was appointed virtuoso da camera of Mantua, a position which allowed him free rein to travel as a virtuoso. In 1729, Locatelli moved permanently to Amsterdam, where he devoted his attention to teaching and composing with an occasional concert tour. He was also involved in importing Roman violin strings and in publishing. By his death in 1764, Locatelli had been successful enough to leave behind a considerable estate, as well as a compositional legacy that remained fairly current until the beginning of the next century. Locatelli wrote a number of concerti grossi, following the example of Corelli. The first set, published in Amsterdam in 1720, include twelve fugues. L’arte del violino (The Art of the Violin), published in 1733, contains the aforementioned twelve violin concertos and 24 Caprices, precursors of Paganini’s famous set for unaccompanied violin. A further set of six concertos was published two years later and a set of six, published in 1744, is scored for four violins, two violas and basso continuo. Locatelli combines the Roman style of Corelli with, in his solo concertos, the virtuosity of Vivaldi in Venice. In his Concerti grossi, works for string orchestra with a smaller group of soloists, Locatelli at first follows the pattern of Corelli, with one or two violas added to Corelli’s solo group of two violins, cello and harpsichord. There is also a Concerto grosso that includes a group of solo wind instruments, in addition to solo violin concertos. Some of these works have programmatic titles. His L’arte del violino (The Art of the Violin) includes 24 Caprices for unaccompanied violin, challenging works that have been regarded by some as foreshadowing the Caprices of Paganini in the following century. Locatelli also published sets of trio sonatas and solo sonatas, including a set of the latter for flute and basso continuo. Courtesy of Steve Coburn, All Music Guide, Classical Archives and Naxos. Intro by your captain. Download free Locatelli sheet music.